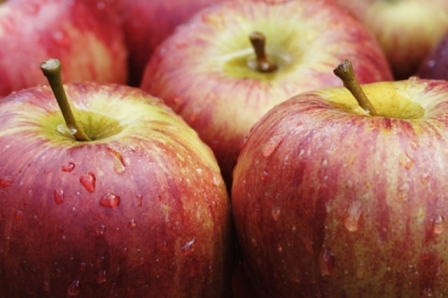 Apples Prevent Diabetes by Eating Every Day. Recent research from the United States found that the consumption of some types of fruits such as blueberries, apples and pears berkaitkan with a lower risk of diabetes. According to researchers, this fruit contains flavonoids, naturally occurring compounds present in fruits, vegetables and grains, which is based on the results of some research related to health benefits such as lower risk of heart disease or cancer. "People who eat blueberries or apples in the sheer number is higher, they tend to have lower risk of developing type 2 diabetes," said An Pan, a researcher from the Harvard School of Public Health. According to Pan, the findings suggest an association, but does not directly prove that the fruits could prevent diabetes. Research published in the American Journal of Clinical Nutrition showed results consistent with some previous research which had already connect a diet high in fruits (rich in flavonoids) associated with a decreased risk of hypertension. According to the American Diabetes Association, approximately 26 million Americans have diabetes. This is caused by the body's inability to produce or use insulin, a hormone that converts blood glucose into energy. Type 2 diabetes can usually be controlled with exercise and dietary changes and without insulin. In the study, researchers from the U.S. National Institutes of Health track the diet of some 200,000 men and women for 24 years. The participants, are requested to fill out questionnaires about how often they eat certain foods and beverages with standard portion sizes. In early research, all participants are known no one had diabetes, but during the study period, a total of 12 600 participants were diagnosed with diabetes. Research results found that those who love the blueberry has a 23 percent lower risk of developing type 2 diabetes than those who do not eat blueberries. While participants who ate five or more apples per week also had 23 percent lower risk of developing diabetes than participants who did not eat apples. The researchers revealed that the flavonoids in fruits may have beneficial effects in reducing the risk of diabetes. "We found consistent results from three research results. Where the three studies indicate that consumption of apples and blueberries beneficial for preventing type 2 diabetes," said Pan. According to Pan, the findings took into account other risk factors, such as weight, smoking and family history of diabetes. "This finding is very good because it encourages us to eat fruits directly rather than fruit juice (processed)," he said, citing recent evidence that the juice of sugar-sweetened fruit preparations and other additives may increase the risk of diabetes.